We had a new film, and a world premiere. And we forgot to blog about it. We’re very sorry. Things have just been a little crazy around here. We did remember to put out an announcement on Facebook though. And we’re very grateful that so many people braved the rain last Sunday to come to the screening. For those of you who don’t already know, James shot the footage for this new film 12 years ago. This was long before Passabe, way before he could even call himself a filmmaker. Edward Yang was a close friend of his father, Leong Po Chih, and despite having a reputation for being intensely private, he allowed James to take a camera onto the set of his final film, Yi Yi. The tapes remained in a box, in a storeroom after that and Edward passed away in 2007. Last year, James met film critic Maggie Lee in Puchon, and in passing, told her about the footage. 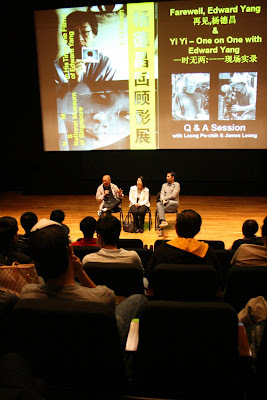 When the National Museum approached Maggie to write the programme booklet for their Edward Yang retrospective, she mooted the idea of a documentary based on the video James shot in the summer of 1999. It was only then, that we learnt that there was no other footage of Edward at work.